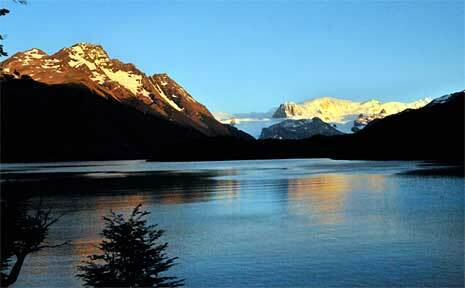 SQUEEZED between the Andean Cordillera and the Pacific Ocean lies the South American country of Chile. The country, 4000km long and an average of only 175km wide, is at the end of the world. Her isolation, challenging geography and schizophrenic weather may have conspired to thwart explorers and early settlers, but it also has preserved a wilderness of unimaginable beauty. A seemingly fragile sliver of land, the deep southern province of Patagonia is home to Torres del Paine – The Towers of Pain, a world famous National Park. Last summer, 120,000 people were drawn to walk its trails and marvel at the kaleidoscope of landscapes. You can trek short distances to iconic views and return to a cosy bar with a roaring fire or max out and circumnavigate the Paine massif and be late for the party by a week or so. Tackling the full circuit requires moderate fitness and is akin to a full-length feature film. On the western perimeter of the circuit is Glacier Grey, a 26km long mass of ice with iridescent blue crevasses that could swallow peak-hour traffic. It covers 270sq km over the Patagonian ice field and its source lies hidden from view in the heart of the Andes that stretches like a sea of white west towards Argentina. But the end of the glacier cleaves giant chunks of ice into a vast turquoise lake right next to the trail – a place where many have sat and hoped to witness such an event. Most see only the debris of fallen ice scattered over the cold lake. Along the way, you can stay in huts with food and sleeping facilities or opt for greater flexibility and carry a tent. Both options are well catered for. The northern trail disappears for hours into a verdant forest of beech and coigue trees where moss, hardy ferns and the thick canopy create a light of cool, dense green. As the track winds up the valley towards the John Garner Pass, it crosses many fresh water streams, the smaller ones ideal for refilling water bottles. The larger ones, spanned by rickety suspension bridges, fill the air with a gentle drone. You eventually rise above the tree line on to bare rock with a clear view of the trail ahead as it follows the steps of John Garner up through a keyhole pass discovered and named after him. At 1241m, it is the highest point of the circuit and howling, icy winds are not uncommon. The southern part of the circuit is the most popular. Most visitors to the park want to see the triple granite 2600m high towers that stand like sentinels at the centre of the massif. But they really hope for a clear dawn when the towers are transformed into intense orange giants as the rising sun plays with the different layers of sediment in the rock. It is these towers that give the national park its name and fame. Hiking to the lookout involves about a 10km walk. Summer is the best time to visit, with March being ideal as the local holidays have finished, the trails are not overcrowded and the temperature is mild. The surrounding area is not limited to walking trails. There is a separate network of horse trails, there are rafting adventures, fly-fishing tours, bubbling hot springs or catamaran rides on the network of lakes that adjoin the southern boundary. The nearby town of Puerto Natales is sufficiently stocked with outdoor adventure stores, lodgings, bars and superb restaurants with menus stacked with the national delicacy – seafood. Everything from sea urchins to eels and smoked abalone to fresh salmon can be washed down with world-renowned Chilean wines. Patagonia may be the farthest place to which man walked from his place of origin, but today it is readily accessible and with treasures such as the Torres del Paine lying in wait, a trip to Chile just might blow you away.